Strong spring, summer and fall color. Easily grown in average, medium, well-drained soil in full sun to part shade. Prefers lightly dappled shade. Leaves may scorch in full sun in hot southern summers. Plant in a location protected from strong winds. Stake trunk for more erect growth or leave alone for full cascading effect. If using as a grouping, plant at least 12 to 15 feet apart. 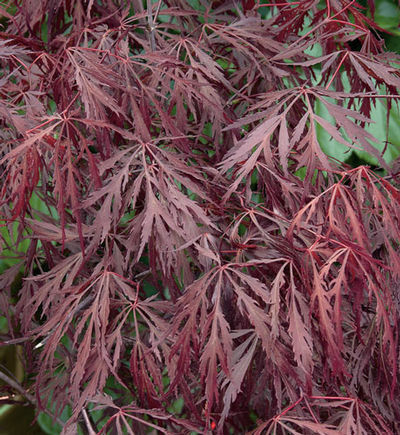 Japanese Maple (Acer palmatum) are known for their colorful foliage through the growing season. Upright multi-stemmed with lobe shaped leaves or graceful cascading with lace type leaves. New cultivars are available in shades of green, pink and variegated. The gray-brown bark is smooth even in maturity. It produces burgundy-red flowers with yellow stamens that are borne on upright or drooping clusters as they emerge in spring. Leaves turn a crimson red in the fall. This small deciduous tree is a great addition in smaller gardens and patios. Full sun or partial shade.